We offer discounted rates for government, non-profit organizations and consultants. Flat rates are charged for all Tiers because of trainer requirements to maintain quality and individualized instruction and coaching. In most cases, one instructor may train up to ten participants. Two instructors are required for 11 – 20 participants and three instructors for 21 – 30 participants. 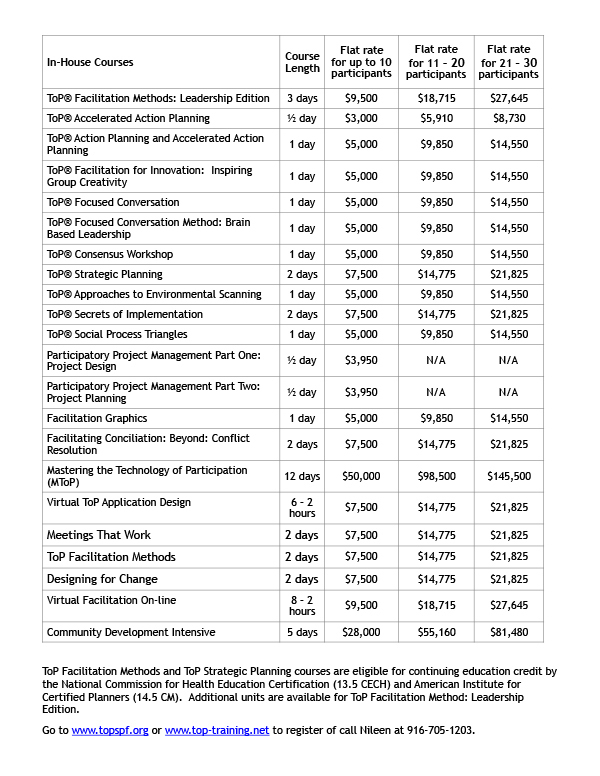 For example, a flat rate of $18,715 is charged for ToP® Facilitation Methods: Leadership Edition whether there are 11 or 20 participants. In-House courses are usually customized to meet the organizational needs. This may increase the price. In-house course rates are based on the discounted government course rates for public courses. Additionally, volume discounts are provided to government for participants 11-20 (3%) and 21-30 (6%). These discounts are reflected in the course rate charts below. We have provided in-house courses to many Government and non-Government clients. For a partial list of clients, click below.